Toast has become a firm favourite at breakfast time, so no kitchen should be without a toaster.  WMF's high quality toasters brown all kinds of bread reliably to just the degree you want - and last a long time as well. Even back in ancient Egypt, bread was toasted over open fires, mainly so that it would keep longer. The Romans spread this method throughout Europe, and finally it travelled from England to America. Before the invention of electric toasters, the bread was toasted on hot stones or on an open fire. The first toasters came from America. The first patent for the consumer electric gadget we love so dearly today was applied for at the start of the 20th century, and since then toasters have been a runaway success. Today, we toast as much as possible, and modern fully automatic toasters brown the bread exactly as desired. Different browning levels, integrated bread centring and a roll attachment are just the basic functions of high quality toasters, and additional functions like a stop button, after-toasting and defrosting function make using them even easier. The crumb tray, which is easy to remove from the toaster and allows easy cleaning, is particularly practical. Of course, our toasters can be bought as individual appliances, but we recommend our breakfast series in various compilations and collections. You can combine the attractive long slot toaster in our LINEO and LINEO shine ranges with a kettle and a filter coffee machine, while the Skyline range, with their shiny Cromargan surfaces, also offers electric salt and pepper mills. STELIO offers the complete breakfast experience. In addition to the basic set, this comprehensive assortment with a clear design can also be enhanced by adding a lemon squeezer, egg cooker, coffee grinder and blender. For individualists who like to make their kitchen into something really unique, our TERRA breakfast series is the perfect choice. The surfaces combine a soft metallic brown-gold colour with glossy stainless steel. Like all of our other consumer electrics, the elements in this series also provide the highest levels of user comfort and are long-lasting. Sliced bread bought from the supermarket isn't the only thing you can put in our WMF toasters. You can use our assortment of baking pans and kitchen gadgets to make your own white bread! With our food processors, it's easy to bring together a white bread dough, which is sure to be a success when cooked in one of our loaf pans! If you have some bread which has gone a bit stale, popping it in the toaster will revive its flavour, enriching your breakfast spread. Enjoy your meal!